Grand Harbour Motor Yacht - Available for sale in Athens, Greece : Atlantic Yacht & Ship, Inc. This Grand Harbour Motor Yacht is a US documented vessel lying in Athens, Greece and is available for immediate sale. The Grand Harbour Motor Yacht is located at Zea Marina in Pireas, Greece, which is immediately outside Athens, Greece and very close to the Athens airport. This is an excellent opportunity for a US Citizen to own a US Documented Vessel in the Mediterranean. One may cruise the Med and then potentially have the vessel shipped back to the United States at the end of next Summer Season. Also, there are several advantages to being a US-Documented vessel. This includes legally avoiding European VAT. Enjoy cruising the Greek Islands on a Cruising Permit! This Grand Harbour Motor Yacht is an original owner vessel and the yacht was custom built by Grand Harbour Yachts in Kaohsiung, Taiwan for a very knowledgeable yachtsman who has built more than 15 boats with the same company since the mid-1980s. In addition to 2 generators, the Grand Harbour Yacht is equipped with universal shore power so that you can plug into dockside power anywhere in Europe or the United States. 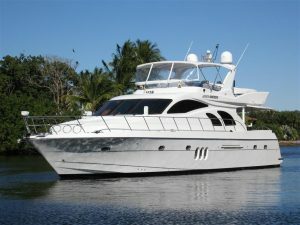 Call Brad Nelson for further information on this vessel 954-205-7944 or email brad@ayssales.com. Don’t miss this deal on a beautiful used 66′ Grand Harbour yacht!